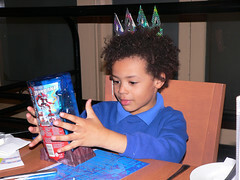 This time one week ago my son turned six years old. I didn’t organise a kids birthday party for him this year as he’s had one for every other year of his life. The birthday parties as he’s known them will slow down now he’s a bit older I think and we’ll do the ‘you choose a couple of friends and do something special with them’ thing from now on for a few years yet. When I was a kid I remember having a party when I turned five. I’d been ill and wasn’t even allowed to have a piece of my birthday cake. I wasn’t too ill that the birthday party had to be cancelled though. I also remember that I was really pleased to get Enid Blyton books for my birthday. I was a bookworm, even back then. Back to JJ. He had a pretty good day apart from me miscalculating the amount of birthday cakes I sent in for him and his class. I’d organised three people to go out to dinner apart from ourselves and we had a really good time. He got his fish and chips as requested and the meal came with a fizzy drink and icecream dessert. I don’t let him drink soft drink because of all the additives in it making him hyper so he had half orange juice and half soda water. The icecream was brought out with a candle in it so we sang happy birthday again. The first time we sang it was because a little girl came out of the toilets somewhat ahead of her mum and very politely asked where we got our hats from. I told her that it was JJ’s birthday and that we just happened to have a spare one and we’d love it if she wore it. She thought that was pretty cool and went back to her table. A little while later her mum came back with her to wish JJ a happy birthday and we sung the song to him. All in all it was a jolly dinner and then it was back to my place for another cake I’d made, this time more than enough for everyone and enough for JJ to take to school for the next couple of days. I was telling someone on Saturday night when I went out that it had been his birthday during the week and then I blurted out, that for the first time in six years I’m enjoying being a parent. I was a bit shocked that I said this, and I think he was too, but it’s true. Let me explain further. I’m not saying that I’ve absolutely hated being a parent until now but I’ve been so caught up in babyhood, then toddlerhood and the accompanying tantrums and then him beginning school and having behavioural problems that it’s been hard to see past that and just enjoy being a mum. There have definitely been joyous moments but the harder moments overtook these. Just about everything I had to do was hard, and keep in mind that I’ve done it all by myself with hardly any respite. Now that his behavioural problems have settled down (not by themselves, but with work on my part and from professionals), and now he’s a bit more independent and now that he can communicate better it’s a lot easier therefore a lot more enjoyable for me. If he ever does read this, I want him to know that I’ve always loved him despite everything. I’ve never resented having him and he’s made me grow as a person – immeasurably so. And he should remember that I have always told him I love him and that I’m very very generous with my hugs and sloppy kisses. After my blurting this out to a friend I was involved in another conversation with two good friends and said it again. Then we got all warm and fuzzy in talking about my kid and one of their kids and they validated my parenting achievements which made me feel really good and valued. Even his teacher made a comment the other day about how much she liked him. I left the classroom with a big smile on my face and feeling really good about this parenting thing for the first time in ages. But back to the birthday, to see some more birthday shots (even one of mother and son) click on the photo above. I submitted this for a newish all women’s blogging carnival. Happy Birthdays big J and little J. It is your birthday big J because it sounds as though you have just grown up….only grownups say what they truly mean (first time enjoyed parenthood comment) and still have the fortitude to love, care and sloppy kiss when they are frazzled, alone and struggling. Little J, you are lucky you have big J. Big J, you are so normal that I wanted to give you a sloppy kiss. Thank you so much for joining the All for Women Carnival. I’ll let Leigh know that you’re up for hostessing at some stage in the future – when I visit your All for Women Carnival, I will come dressed in my bestest Safari Suit. I loved the honesty of this post! We’ve all felt that way at one time or another, we’re just afraid to admit it! I think it is wonderful that you wrote this post. Many parents have similar feelings but no one wants to be honest because they feel like doing so makes them a bad parent. Being a parent is a very difficult job. Saying it is trying never means you love them any less. Your honesty will help others in many ways! Thanks for the post! Jen, I love this post. I’m all teary….and you know exactly why. You sweet mum you. A little late but Happy Birthday J, it sounds like you had a great birthday. Good idea on the parties front, we just did a party for our 7yr old daughter..it was a nightmare! Save yourselves and never do it LOL. Such a lovely post, it makes us realise that it’s ok not to love parenting 24/7 there is no shame in it. We still love our kids just the same. Thank you for joining the All Women Carnival and offering to host. I have added you the hosting schedule for the 30 of July.